Good morning... as I type this (on Sunday night), I am watching the movie Popeye with my kids (with Robin Williams). Man has it been a long time since I've seen this movie! On to todays project... this one was Carla Woelinga's swap from Friday nights shoe box swap. 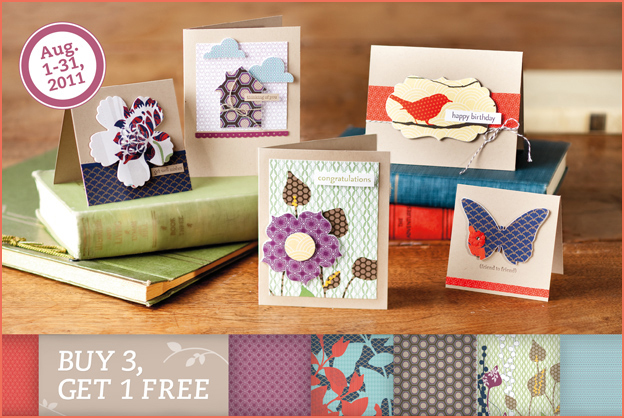 I don't yet have the Berry Blossoms paper - it is gorgeous - the colours in it are amazing! In addition to the great colour combination (Wisteria Wonder, Lucky Limeade and Calypso Coral), I also love the layering of the punches - wide oval on top of the decorative label. It's hard to tell but there is also just a bit of crystal effects in the centre of the apple... LOVE it! Thanks Carla for sharing.